The ORO300 is the third offering in OFM's ORO series of chairs. This one is comprised of a Greenguard certified, polyurethane seat and back in your choice of black or cream. It features a 300 lb. 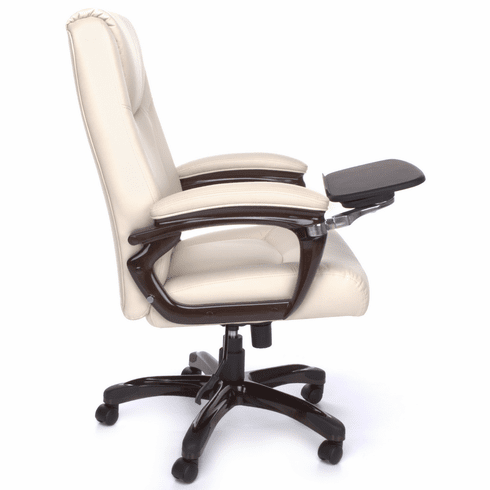 weight capacity, one touch pneumatic seat height adjustment and tilt with tension adjustment. The arms and base were manufactured with a wood grain look that is very attractive, especially as a cream leather office chair. Now on to the tablet arm! It easily pulls out and swings away when not needed. The arm measures 14"W x 9.50"D and allows you to use your mobile device of choice without the need of a desk. It's position can also be adjusted, and it has a non-slip surface and a raised edge to keep items secure. Many tech companies use chairs like the ORO300 in their training rooms for a more comfortable approach to meetings, as opposed to using a bulky conference table. Limited lifetime warranty from OFM. Dimensions: Seat Size: 22"W x 20"D. Back Size: 21"W x 24.50"H. Seat Height: 19.75" - 22.75"H. Overall Height: 43.25" - 46.25"H. Overall Width: 28". Overall Depth: 30.50". Base Size: 27". Meets ANSI/BIFMA office chair standards. This tall computer chair typically ships out in 1-2 business days from NC.